There is nothing inside these chocolates that makes them ‘truffles’ necessarily, it’s just that the mixture is so decadent that when it sets thickly – as it does in the heart-shapes moulds I have because they’re so deep – it honestly tastes and feels like Belgian chocolate truffles melting into your mouth, and yet totally free of refined sugar, dairy, gluten, eggs and preservatives. They look impressive but I’ll let you into a little secret: they are so easy to make! 4 simple ingredients and that’s it. All you need other than that is a saucepan, a spoon and a silicone heart mould. I used one similar to this. Fancy treating your loved one? Or just want to keep something rich and decadent nearby for those days when you’re really craving chocolate? These are the ones! Simply put all the chocolate ingredients into a saucepan and melt gently over a low heat, stirring often. Once it’s melted, use a teaspoon to spoon into the little hearts and put it in the fridge to set for a couple of hours then turn out and store in a container in the fridge. There is nothing more satisfying than taking a bite out of a chunk of chocolate, and indeed nothing more satisfying at all than knowing that that chocolate is made of only pure, natural, healthy ingredients than not only are not detrimental to your health, but are in fact beneficial to your health. I usually make my chocolate truffle hearts when I want good old plain chocolate instead of brownies or cakes or cookies, but this time I thought, You know what, just shove the entire mixture into a silicone baking tray and let it set like that instead of putting it into individual moulds. I love the combination of rose and pistachio, I think it must be something to do with my Moroccanness! so I decided to put a touch of rose water, just enough to taste it faintly on the tongue, but not enough to take away from the exquisiteness of the chocolate, and the pistachios give it a bit of crunch and a touch of savoury to mix in with the sweetness. Simply put all the chocolate ingredients (not the fillings) into a saucepan and melt gently over a low heat, stirring often. Add the rose water if desired. Once it’s melted, pour it into a baking paper-lined silicone baking tray and sprinkle the fillings into it. Put it in the fridge to set for a couple of hours then cut or break into chunks. My mum always makes coconut pyramids for Passover which are yummy but of course they use sugar so I thought I’d whip these beauties up as an alternative Passover (and any other time) treat. They are gluten free, dairy free, sugar free, egg free and vegan. Melt the coconut oil then mix all the coconut ingredients in a bowl. Line a baking tray (I use a square silicone one) with cling film, leaving enough hanging over the edges, then press the mixture into it. Remember, they need to be cut into fairly substantial bar sizes once set so keep the thickness and don’t fill the whole tray if it’s too big. Put this in the freezer for half an hour. Make the chocolate coating while it’s in the freezer by melting all the ingredients in a saucepan over a gentle heat. Take the coconut mix out the freezer and cut into bars, then dip them into the chocolate and place on a plate and put in the fridge to set for 30-60 minutes. I can’t take the credit for this one, I got the inspiration from Waitrose recipes! It looked so delicious that I thought I’d try it and put my own spin on it. Honestly guys, it’s so delicious and so moreish, you must give this one a go for these cold winter days. Preheat the oven to 200 degrees. Place the cauliflower and garlic on a baking tray, drizzle with olive oil, season with salt and pepper and mix well. Place in the oven for 20 minutes. Meanwhile, bring the stock to the boil in a large pan. Add the onion and bay leaves, cover and turn down to a gentle simmer. Now make the croutons by using a handheld blender or small blending jug to blend up the thyme leaves, garlic and olive oil. Add this to a bowl and add the bread and mix it all in with your hands to cover the bread pieces with the mix. Line another baking tray with parchment paper and put the croutons on the baking tray and put in the oven for 15 minutes or until browned. When the garlic and cauliflower are cooked, remove from the oven and add to the stock. Cook for 5 minutes. Remove from the heat and take out the bay leaves. Using the handheld blender again, (or a normal blender if you don’t have one) blend until smooth and season to taste. Serve with a drizzle of olive oil, some thyme leaves and the croutons. Preheat the oven to 180° and line a loaf tin with baking paper and grease with coconut oil. Make the chocolate sauce by melting all the sauce ingredients on a gentle heat in a saucepan. Coat the whole banana in the chocolate sauce and leave in the fridge to set. Mash the other 3 bananas in a large bowl and add the coconut oil and maple, then add the flax mix and mix well. Now add the flour, baking powder, baking soda and cinnamon. Move just under half the batter into the loaf tin then put the chocolate-covered banana on top. Now add the rest of the mix on top of the banana. Put it in the oven for around 25–30 minutes, or until a fork comes out clean. My oven tends to cook things much quicker than most so it’s been a bit of a learning curve, your oven may need more time. Leave on a wire rack to cool then turn out of the loaf tin onto a plate. Delicious served with peanut or almond butter! Braxton trying to steal my juice! We spent two weeks in Spain recently. We are fortunate enough that Daniel’s parents have a place in Estepona so it makes it really easy when travelling with a baby as we already have everything we need there. When we arrive the first thing we usually do is take ourselves to the natural health shop down the road to stock up on superfoods, smoothie ingredients (Braxton loves his breakfast smoothie!) and other foods and bits, so that we can eat at home some of the time. But we also love eating out; after all, what is a holiday if you have to cook all the time? And I love Spanish food. I do relax with my diet a little bit on holiday but I still don’t have dairy or sugar and still don’t give Braxton dairy or sugar; for me, they are the worst ‘foods’ and once you’re used to it, it’s not hard to stay away from them. I could be a little more lax now I’m back in remission but it’s just not worth it, for my remission, my stomach and Braxton’s all-round health. I do enjoy the odd glass of wine or a gin and tonic though! So anyway, when we were in the health shop, the guy in there told us about a new vegan restaurant that had opened up in Marbella, only 20 minutes from where we stay. My husband, who used to be the world’s biggest meat eater and couldn’t fathom the idea of a vegan diet, got so excited and made sure it was our first meal out. It still amazes me how he’s embraced this lifestyle so openly. We arrived at the place and although it was small and discreet, it was perfectly shabby chic; English country garden-style wrought iron chairs outside underneath a tree, reclaimed-wood chairs and small wooden tables indoors within a bright, minimalistic yet warm atmosphere with a dessert bar and a book stand. The only drawback was that they don’t yet have any high-chairs for babies as they have just recently opened, but they promised us they’d be getting some soon. When Braxton eats these days the surrounding area ends up looking like a school food fight so we prefer to have him not in the buggy or on our laps. But he sat on Daniel’s lap and we all just got a bit dirty which is also fine every so often! The menu was mouth-watering. I just love going to places where I know I can order anything for Brax and not worry about it. All organic, plant-based produce with nothing processed and not a fish finger or a chicken nugget in sight. I honestly can’t pick which one was the nicest – they were all seriously delicious. The ravioli was so creamy you’d think it was dairy; the spaghetti was just so indulgent and the bean burger – Daniel’s favourite – was out of this world. We finished with dessert – of course, would be rude not to! – of an after-eight slice which was a mint cacao brownie type thing, a blueberry cheesecake and a mini white chocolate ball. We’ve never seen Braxton eat so much before – he just loved it all – and it was a nice feeling knowing that it was all healthy and nutritious for him. We left feeling so full but my god was it worth it. So good in fact that we went back the following week for another lunch even though we usually make a rule on holiday not to go to the same restaurant twice. The chef, Carlo, was so inviting and the guy that helps him, Carlos, was so friendly and talkative. We spoke to them about the restaurant and their hopes for it. Carlo hopes to hold some plant-based cooking classes there over the winter so if you live in the Costa-del-Sol or are visiting over the winter, please get in touch with them. I have the biggest backlog of recipes waiting to go on the blog but this turned out so unbelievably amazing that I had to share it with you! I’m a nut butter fanatic at the best of times but this has now trumped peanut and almond butter. It is so creamy and sweet and wow – just delicious! We finished one jar of it within 2 days and this is the second jar. Requests are coming in from the family now to make more for everyone. You seriously have to make this and spread it on anything – or just eat it off the spoon, whatever, just make it! Oh, and it’s really high in protein so great for spreading on toast for the kids. I actually spread a bit of it on Braxton’s porridge bars for him. So easy to make and only 2 ingredients – there’s just no need for store bought! You will need a high-speed blender for this, a normal blender won’t break it down enough unfortunately. 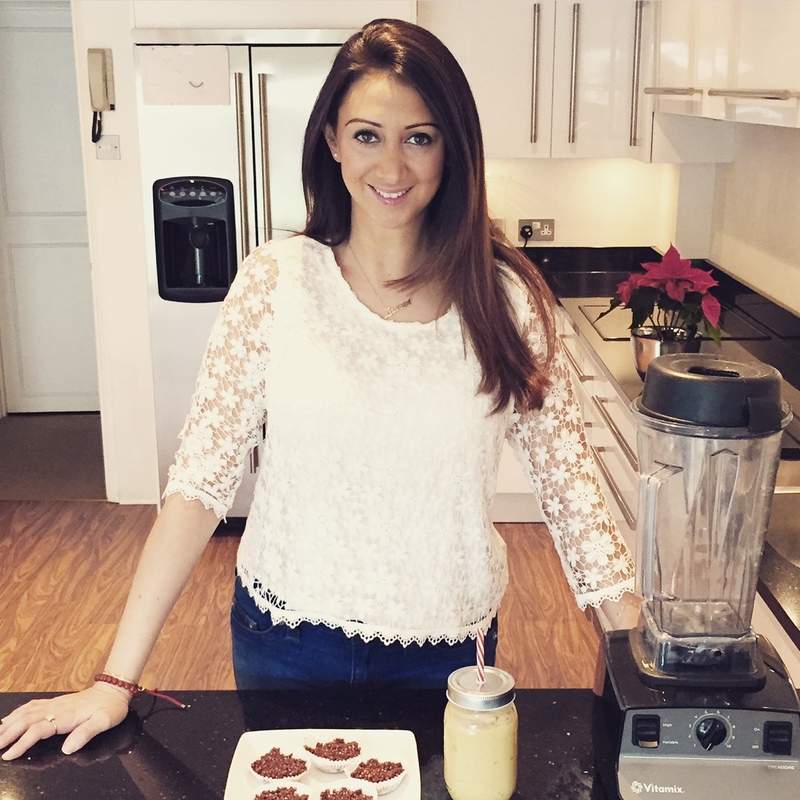 I love the Vitamix – you can literally make anything with it! Heat the oven to 180 degrees. Put the cashews on a roasting tray and put in the oven for 10 minutes, until they go golden but not burnt – keep an eye on them. Once they’re out the oven, put them in the blender with either a tsp of vanilla bean paste or the insides of a vanilla pod scraped out and turn the blender up to the highest variable until it starts breaking it down into a thick butter – about 3 minutes. Once it is a bulky consistency, get it all off the bottom with a spoon, then turn down the variable and the speed and start again on a low speed. Gently increase the speed keeping the variable on low. Over the course of about 3-4 minutes it will make it runny. You should wait until it goes really runny even though you think it might be tasty when it is thick. It’s worth the wait! Welcome to Organic Spoon! My name is Lauren Vaknine and I'm a writer, a food blogger and a mummy and a lover of animals, literature and cake! I was previously disabled with juvenile rheumatoid arthritis and am now in remission thanks to homeopathy and diet. Why not head over to the 'About' page to read more about me and how this blog came about. I hope you enjoy my recipes!